In 2012 Mobileiron came after 400% sales increase in 2011 and they had an investment of $60M. Since 2012, following the 2011 euphoria, they receive two more rounds of $88M additional capital, for a total of $148M. That was an increase of 150%. 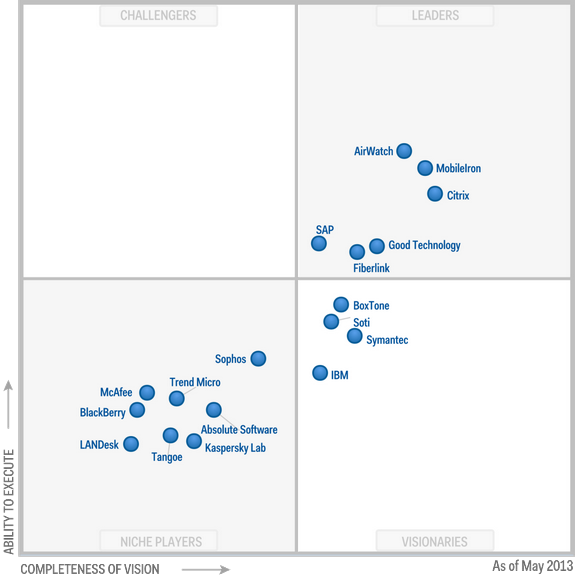 This is how the Gartner MDM Quadrant looks in 2013. What Mobileiron did with this huge capital injection? They started hiring massively left and right. The web site management team looks like Cisco and one can see executive experts in company politics making compromise decisions. Most of them never started a company before. These are seasoned and large enterprise companies, who will take huge chunks from the business potential among the leaders in MDM enterprise space. 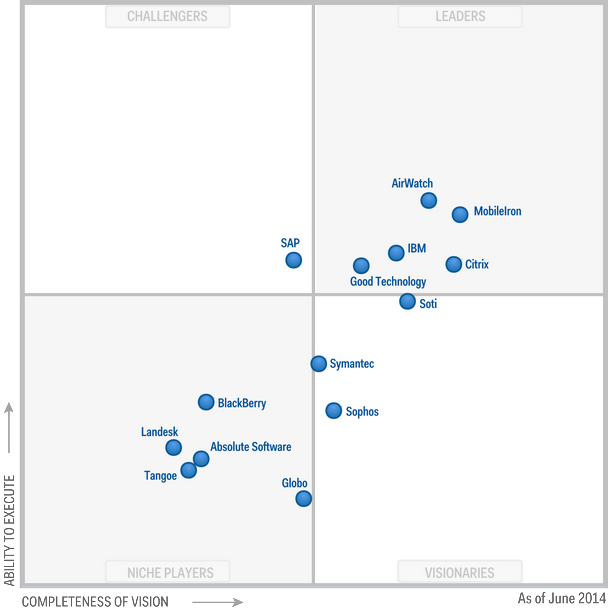 In 2014 Magic Quadrant, we can big threats from IBM and Citrix. Mobileiron wants to go IPO, because it can not compete with the giants. Will an IPO be enough? They are not Facebook. There is no Zuckerberg there. If that happens before MobileIron cashes out through some form of exit, they will disappear like the smoke from a dwindling fire.